The Gray Iron Fitness Newsletter, Issue #236 Cross Training. In this newsletter . . . I believe in cross training for two big reasons. No. 1: Even the most dedicated exerciser gets tired of doing the same thing month after month. By doing varied exercises and workout routines your interest remains high. No. 2: Over-use injuries are much less likely when you mix things up. Think of the dedicated jogger with worn out knees after years of doing the same old pounding on his or her joints. Or the year after year maximum-poundage bench presser with blown-out rotator cuffs. Don’t get me wrong. There’s nothing wrong with running or bench-pressing — when done properly and within reason. And cross training goes a long way toward taking care of the “within reason” part. With varied training, you are not pounding the same body parts in the same way, workout after workout, year-after-year. Instead, your body is challenged in a much more varied way. Suppose, for example, your workout cycle involves three 30- to 45-minute resistance-training sessions weekly, and three 20- to 30-minute cardio days. Typically, that might mean three days of the same bodybuilding exercises, and three days on the same treadmill or running path at pretty much the same pace. Day 1. Upper-body weight training. Five sets of 5 to 8 reps for each exercise. Lower reps allowing you to use heavier weights. Day 2. Thirty-minute Fartlek, a nice outdoor run, alternating your pace: jog/run/walk/sprint, etc. Day 3. Lower-body weight training. Five sets of 5 to 8 reps. Lower reps allowing heavier weights. Day 4. Group aerobics class, 30 minutes. Day 5. Upper-body weight training. Two to three sets of 10 to 15 reps per set. Similar exercises as day one, but with lighter weights and higher reps.
Day 6. Twenty minutes of sprint intervals on a stationary bike. This is just a sample. The possibilities are almost endless. Mix in cardio exercise classes, swimming, bodyweight calisthenics, hill sprinting, weight training, hiking, and exercise band workouts. All of them are good in a program for general, all around fitness. Just be sure to get in at least two resistance-training sessions and three cardio workouts per week. Older seniors can easily adjust their programs by using bands instead of weights and walking replacing running. Don't overdo it. Long, arduous workouts day after day are not the way to go. Whether at the health club or at home, keep workouts concise and focused. Suppose you are overweight or in bad shape, or both? Forget the past. And seize the day. If you don’t know how to start exercising regularly, simply begin by walking. Just open the door and go. Gradually, increase the time and distances of your walks. Add body-weight movements later, push-ups, sit-ups, deep knee bends, etc. For now, just get up and go on that walk. Amazingly, things will fall into place. How far you progress beyond that is up to you. If you do no more than the above, and do it regularly, you will have made measurable improvements in your lifestyle and, more than likely, your longevity. If you want a step-by-step starter program, see my outline for senior beginners. Now in my 80s, I’m still at it. I’m not that exceptional. Many subscribers who write are about my age live a fitness lifestyle. They do so because it is a way of life they enjoy and like how they look and feel. The thing is to start doing something, no matter what your age. And don’t stop. The old saying, "Use it or lose it," is true. 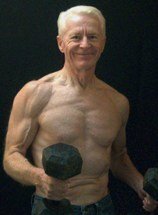 Today, they call losing it “sarcopenia.” It is an unpleasant word (from the Greek), meaning poverty of flesh, the wasting away of muscle. And that’s what eventually robs one of independence and quality of life. Get up off the couch and go for that walk. You’ll love it. If you like the newsletter, we're making it easy to share it . . . The Gray Iron Fitness Newsletter is a free publication sent twice monthly to subscribers. The purpose is to provide honest and realistic fitness information for people age 50 and above. I have never been paid or received compensation of any kind to write a positive review or endorse a product. If I say that I personally use a product or service, it is because I find value in it and have paid for it with my own money. Like newspapers, magazines and television, this newsletter and my web site contain advertising and marketing links. Naturally, I am compensated for these. The newsletter and web site provide information to help users establish and maintain a fitness lifestyle. But fitness information is not the same as fitness advice, which is the application of exercise and dietary practices to an individual's specific circumstances. Therefore, always consult with your physician for assurance that fitness information, and your interpretation of it, is appropriate for you. Your comments and questions are always appreciated. Simply click on the "Reply" bottom.